OMG that dog is wearing a muzzle! Photo: Little Birdy. Luna rocking “stay” even though a rabbit went past. It must be dangerous! FALSE. Let’s get that stigma out of the way, straight up. Muzzle training is a super responsible thing to do, for you and your dog. There may be times when it is necessary for your dog to wear a muzzle, such as at the groomers or in an emergency situation. The more your dog is already conditioned to comfortably wear a muzzle, the less additional stress they will suffer under these circumstances. For example, say your dog is somehow hit by a car and is injured. In pain, your dog could lash out and try to bite while you are trying to stabilise him for transport, and again during the subsequent vet attention. If your dog knows the muzzle, putting one on will be easier, be familiar for your dog, and prevent any bites to himself or people. It’s setting you all up for success! It’s also setting up for success if you do have a reactive or fearful dog, or a dog with high prey drive. It allows you to complete training and desensitisation work with the confidence that no accidents can happen. That’s right, like some other tools we use on our dogs, it’s also about giving us human handlers CONFIDENCE. Sometimes this can make all the difference to a dog’s demeanour. It’s true, lots of dogs don’t like wearing them. So yes, it must be conditioned correctly. Using food and slowly building to fitting the muzzle can make the muzzle predict good things. The dog should also be able to drink & pant freely, and have treats given to them – for this reason I prefer the basket style muzzles over the cloth muzzles, but I’ll do a post on the different kinds another day. Need help muzzle training? Call me, I can help. I still walk my two on head collars and yes they are mistaken for muzzles a lot but they have very different functions. 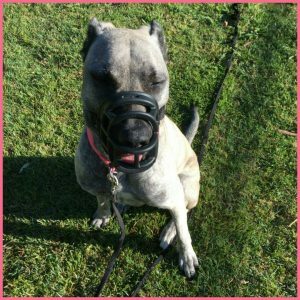 The bridle or head collar can be good to control your dog’s head and close their mouths if needed, without it being a full muzzle. Good on you for keeping up the training and acknowledging when maybe one method wasn’t great for you.